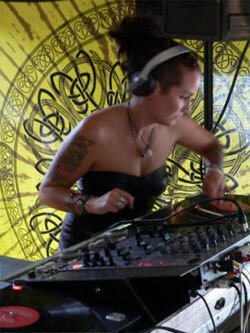 DJ TIDDLES (A.K.A Carmel,Singer from Punk and Ska band DOGSHITE),started djing Ska in 2007 and has since played an increasing number of gigs across London and beyond, seeing her sound becoming steadily more popular. Playing a medley of old-school 60's Jamaican Ska, 70's and 80's 2-Tone and newer more recent American and U.K sounds has given her the scope to keep most dancefloors happy, or simply keep feet tapping if that's what's required. Gigs include Glastonbury's Slippery Dicks Love Shack, The Coven 2 Oxford, Massv Halloween Venezuala, Hendre Hall Bangor, The Grovensor Stockwell, Mutate Britain afterparty London, The Specials aftershow party London. Dyskonform party Barcelona, The Unsound beach party Italy, Trash City and Slippery Dicks Love Shack, Glastonbury, Guilfest, 'Booted and Suited' Guildford, 'No Sleep 'till Brixton part 2' The Jamm London. The opening set for Ska Cubano at The Jamm London for regular Ska outfit 'Booted and Suited' and 'Club Neurotica, Rum Shack and The Leisure Lounge Present NEW YEAR'S EVE: The End Of The Noughties London. Summer 2010 has seen her play Guilfest, The Unfair Ground, Glastonbury, Boomtown Fair with her band DOGSHITE, Onion Fest, Love4life, Cornwall, 'No sleep 'till Brixton, The Jamm, London. In recent times she has renewed her love of Ragga and Dancehall music, having grown up listening to it and replenished her record bag to play at Treefest, Nottingham and Trash City Glastonbury. Bring on more! Check out her band DOGSHITE(www.myspace.com/dogshite), and also her Techno/Ska collaborations on STAY UP FOREVER(stayupforever.com) and HIGHWIRE with Guy "Geezer" Mcaffer, Chris Liberator, and DJ K.N. from Japan.